*The best news about the fall television season? It’s not the fact that the amazing Homicide veteran Andre Braugher (on the promising Last Resort on ABC) and the equally amazing Breaking Bad villain Giancarlo Esposito (on the equally promising Revolution on NBC) have their own pilots, so even more people can be exposed to their awesomeness. No, the best news of this television series is that the equally great Jay Pharaoh is replacing Fred Armisen as the election-season Obama in Saturday Night Live http://www.eurweb.com/2012/09/snls-jay-pharoah-to-play-president-obama-this-season/), although for some, the jury is still out after his debut outing. It’s about time. 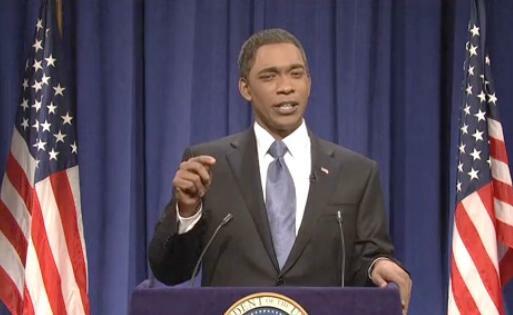 The occasionally-funny Armisen had his moments (his David Patterson impression was killer, as seen here http://www.hulu.com/watch/48719) but his Barack Obama was bland and uninteresting, and nowhere near the brilliance of other Saturday Night Live political impressions. Pharaoh, though, is a true, true talent, and it’s a good bet he’ll rise to the occasion. Watching him on Saturday Night Live last season was like watching an extraordinarily talented youngster on a baseball or basketball team stapled to the bench by a crusty old manager. His two spot-on Denzel Washington impressions (http://www.hulu.com/watch/184584) were the best thing SNL has aired in years (http://www.nbc.com/saturday-night-live/video/unstoppable-trailer/1259996), but he was disappointingly absent in most episodes, and the show (like Armisen’s Obama), was flat and lifeless when he wasn’t on there. Let’s hope this ennui disappears with the new Obama character. Pharaoh has a real chance to break through here, especially paired with the underrated Jason Sudeikis impression of a robotic, cookie-cutter Romney (http://videocafe.crooksandliars.com/heather/snl-takes-another-shot-romneys-inability-c) and give this fraught campaign season the shot of parody it needs. It’s during the presidential election season when the venerable weekend workhorse starts to interject itself back into the national consciousness. In 2000, the goofy Will Ferrell / Darrell Hammond Bush and Gore impressions captured the theater of the absurd that accompanied that election; eight years later, Tina Fey’s vicious Palin helped to define the McCain campaign. Hopefully, Pharaoh can carve out his own niche and create an impression for the ages this fall.